Water data—and its collection, processing, analysis and dissemination—is essential for sustainable natural resource management. Sharing water data is crucial for stakeholders to build trust and effectively collaborate on transboundary water resources management. It leads to knowledge generation. It is key to effective integrated water planning. And it is imperative for timely flood warning and disaster preparedness. Water data covers information on hydrology and river flow, abstraction of water for irrigation, flood management and mitigation, hydropower, tourism, use of watercourses for navigation, and environmental flows. And it can take many forms, be it historical flow data and raw datasets for academics and researchers or models and scenario planning for policymakers and planners. Many initiatives around the world streamline the flow of water data whether domestically across agencies or among regional partners across international borders. In the United States, many online platforms or hubs aggregate and improve public access to water resource data. For example, the Western States Water Council in the United States fosters cooperation among its 18-member states, provides a forum where they can discuss water resource challenges, and offers a Water Data Exchange portal so that all relevant state agencies can share information in a common data format. In the same vein, the European Environment Agency and EU in 2007 launched the Water Information System for Europe, a web repository of all member states’ water-related information, from water policies and data, to modelling, projects, and research on surface and ground water resources. At the multilateral level, the United Nation’s High-Level Panel on Water seeks to improve governments’, societies’, and the private sector’s access to and use of water and hydro-meteorological data. Its World Water Data Initiative provides guidance on good policies, new technology, and harmonization through common standards. Although there are good reasons to share information, data sharing can be fraught with high capital costs, conflicting interests, varying levels of technical capacity among data users, ethical and security issues, and general access challenges. Perhaps the most insurmountable barrier to effective and free-flowing water data sharing of all is politics. Countries may actually intentionally design vague data exchange mechanisms to allow for greater ﬂexibility in the face of resource constraints or for political expediency. Agencies tend to be risk averse when it comes to releasing water data; sharing one’s data in water treaty negotiations, some believe, weakens the bargaining position of riparian nations. As the age-old Latin aphorism goes, “scientia potentia est,” or “knowledge is power.” But data sharing has also resulted in misleading secondary analyses or mischaracterized data, leading to a culture of discomfort and, in some cases, distrust. Ultimately, data providers are loath to lose control over how their data is used and, more importantly, the kinds of (potentially erroneous) conclusions the data users may draw from it. Not only should the best approaches for collecting, analyzing, and sharing socioeconomic data pertinent to water resources be considered, these issues surrounding accurate data use are compounded by ethical considerations when data are closely linked to individuals and households. In the Mekong region, there is a long history of cooperation around natural resources and water resources, with the Mekong River Commission (MRC) leading the charge with support from the donor community. In response to the increased demand for water data, and in order to implement the Commission’s Procedures for Data and Information Exchange and Sharing, the MRC Secretariat is looking to change the workflow related to data acquisition and management and facilitate the actual delivery of data, outputs, and products to member countries and the public. It is developing guidelines to standardize water data. While the Secretariat has continued to close data gaps and developed the capacity of the Lower Mekong governments, challenges remain. To help address development challenges related to a changing climate and better manage land and water resources, the USAID/NASA-funded SERVIR Mekong program, a geo-spatial data for development program, led by the Asian Disaster Preparedness Center, harnesses space technology and open data. SERVIR-Mekong aims to improve how user-tailored geospatial data, products, and services are shared. To do so, it is developing user-tailored data, tools, and applications. One example is a regional Mekong land cover monitoring system that will serve to support research and development, carbon accounting, land use planning, disaster risk reduction, water management, and climate change adaptation. To improve sharing, they are looking to better organize the reference database system, as well as improve the actual interface for users who are not well-versed in programming. Against this backdrop, the Pact Inc.-led Strategic Infrastructure Partnership— a core program of the Lower Mekong Initiative (LMI)—carried out an assessment of needs around water data in the region. The results of this assessment ultimately shaped U.S. government policy. In August 2018, the LMI partner countries joined Australia, the European Union, Japan, New Zealand, the Republic of Korea, the World Bank, and the Mekong River Commission in a non-binding joint statement to strengthen water data management and information-sharing in the lower Mekong. Further highlighting this commitment, U.S. Secretary of State Mike Pompeo announced $2 million in support of a Mekong Water Data Initiative. At the 2018 Greater Mekong Forum on Water, Food and Energy, practitioners were interested in data sharing and the nuances of the water, food and energy nexus and issues around governance of water resources in the region. While many of these practitioners knew about the Mekong Water Data Initiative and the rationale behind it, many still have questions about how to carry out such an endeavor. The matter of national security was raised on numerous occasions, as well as issues related to sensitive socioeconomic data associated with water resource use and ethical considerations. Concerns around data users and data providers’ motivations for sharing data were discussed, and the importance of transparency to overcome any potential resulting distrust. Access to data is a function of data providers’ and users’ willingness to share and trust others. And it can be stymied by geographical and jurisdictional barriers, diversity in existing resources and infrastructure, and variations in policies and interests/objectives. Geopolitics, many agreed, play a big role in the degree and quality of water data sharing, and as such, participants were acutely aware of the need to define the level of data sharing needed—and demonstrate good practices that lead to win-win situations—to facilitate water resources data and information sharing. There was a general consensus that data standards must be defined, and quality assurance/control must be emphasized in any future water data sharing platform to enable effective sharing of water data in the medium- to long-term. However, a gap between raw datasets and data products (for example web-based flood warning applications), coupled with a lack of capacity to analyze data dilutes the ability of regional actors to make time-sensitive management and policy decisions. A regional water data sharing platform would provide the basis for better and more effective regional collaboration, provided technical aspects are addressed. Key priority issues in the region related to water resources include collaboration around wetlands and ecosystem services, water demand for irrigation, flood control and diversion infrastructure, fisheries resources, water quality and quantity, hydropower, and socioeconomic dimensions of multiple water use. However, what form should such a water data sharing platform take? Should it be a centralized data repository that is under the purview of a regional “backbone” organization such as the Mekong River Commission? Or perhaps a peer-to-peer access-controlled collaboration ecosystem that allows one to search for people and data and directly negotiate with global collaborators? This was a topic forum participants discussed often. Over the course of the next three years, Pact Inc., a nonprofit that fosters international development— under the aegis of the Lower Mekong Initiative’s Strategic Infrastructure Partnership program—with the backing of the Friends of the Lower Mekong and other U.S. government partners, will support governments across the region to strengthen the collective capacity around issues pertaining to the water, food, and energy nexus, and develop a collaborative water data sharing platform. As climate change impacts continue to increase in frequency and severity, time is of the essence to bridge the water data divide and harmonize infrastructure development across the Mekong region. David Bonnardeaux is the Technical Manager for Natural Resources Management at Pact Inc., where he provides technical assistance and designs new programs across the organization’s portfolio. 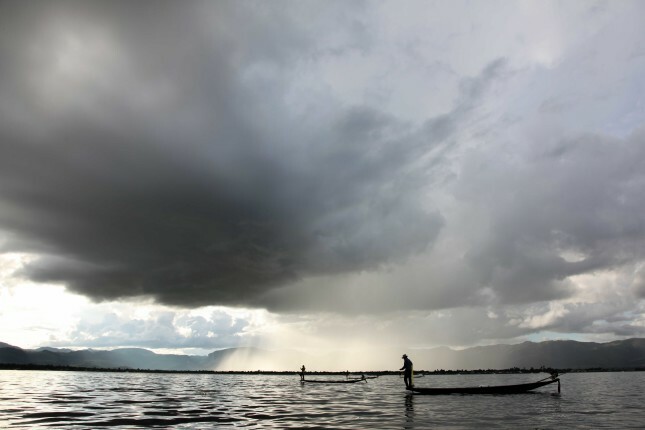 Photo Credit: Inle fishermen, Myanmar. Photo courtesy of the author. All rights reserved.